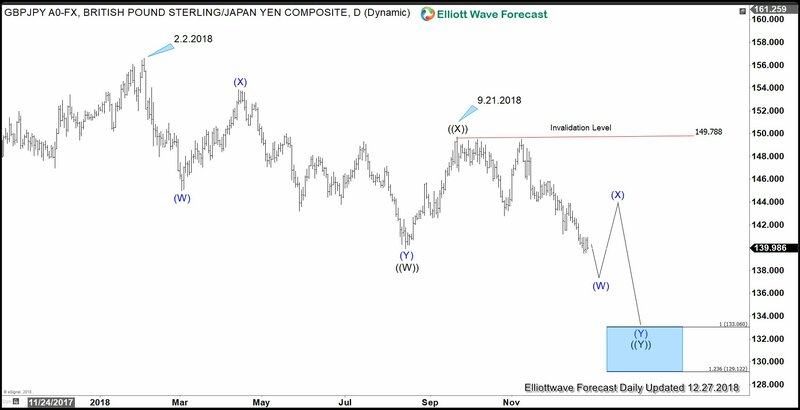 In this updated article and video below, we will follow up our view on Japanese Yen outlook in 2019. 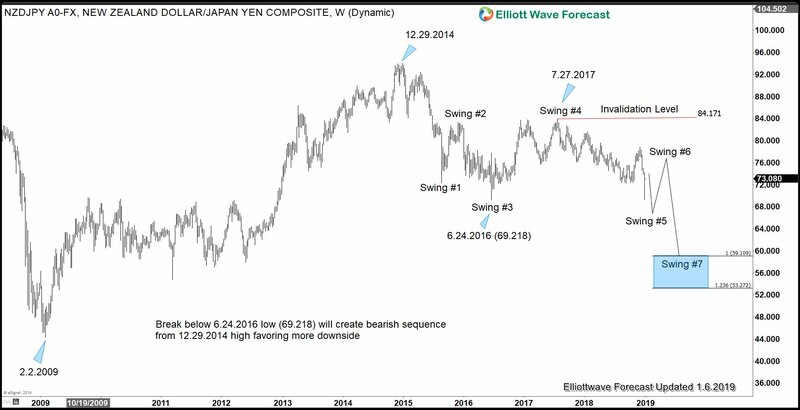 We wrote an article in late December last year titled “Will Yen Continue to Outperform in 2019?” In the article, we said that Japanese Yen can continue to strengthen against other major currency pairs in 2019. In that article, we presented two daily technical charts below to backup our thesis: GBPJPY and CADJPY. Some financial media speculate a couple of possible reasons for the Yen flash crash. One possible reason was due to the thin liquidity during witching hour (5 – 6 pm EST). This is the time when New York traders leave the office and Tokyo traders arrive. Further exacerbating the thin liquidity, last Wednesday was also a public holiday in Tokyo. Another possible reason was due to Apple’s sales warning after US stock market closed on Wednesday. However, the profit warning news came 1 hour before the Yen flash crash, casting some doubt how important Apple’s warning was. At EWF, we don’t try to speculate or guess about fundamental reasons behind move in the market. After all, usually this is an after-the-fact exercise to find the “reasons.” We believe that technical charts can and often speak very loudly about the expected path. After last week’s flash crash, we have seen Yen pairs recovering nicely. As we reach our downside target in just the first week in 2019, the question is what’s in store for Yen for the remainder of 2019? We will update our view and argue from the three technical charts below that last week was only the beginning of the Yen’s strength and we will see further strength in Yen in 2019. During the Yen flash crash last week, AUDJPY broke below 6.24.2016 low (72.53) and now shows a 5 swing bearish sequence from 4.11.2013 high. The 5 swing sequence is based on 7 swing corrective sequence, also called a double three Elliott Wave structure (WXY). This suggests that as long as pair stays below swing #4 at 90.35, more downside is favored. 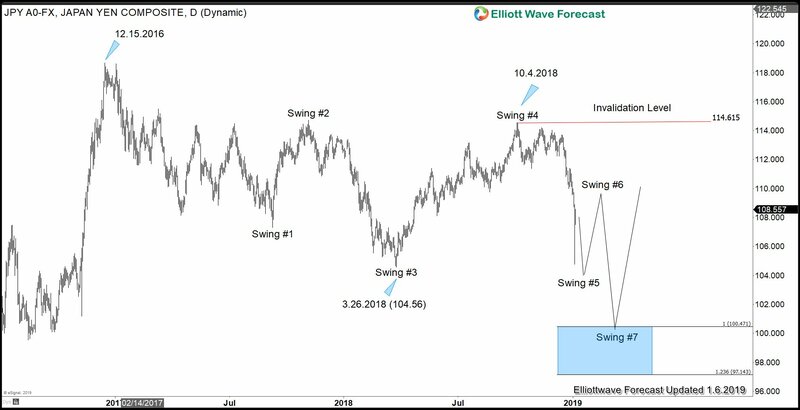 NZDJPY weekly Elliott Wave sequence outlook above shows similar situation with AUDJPY. It is close to breaking below 6.24.2016 low (69.218). If pair breaks below that low, then it will also show a 5 swing bearish sequence from 12.29.2014 high, favoring further downside while rally fails below 7.27.2017 high (84.17). 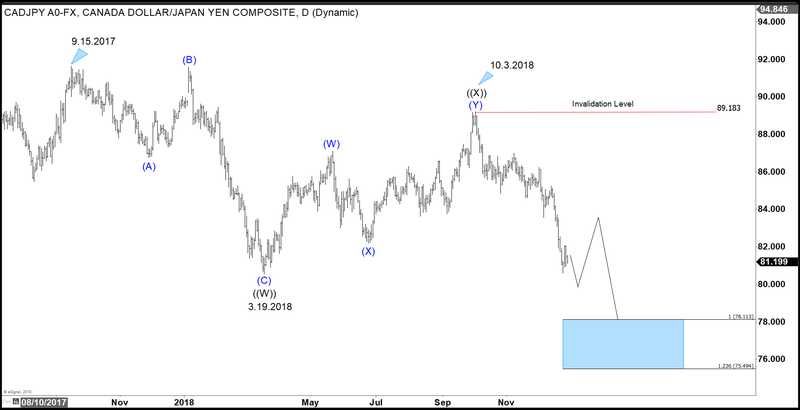 Finally, USDJPY Daily Elliott Wave sequence above shows that if it breaks below 3.26.2018 low (104.56), it will also show a bearish sequence from 12.15.2016 high, favoring further downside while rally fails below 10.4.2018 high (114.6). Both USDJPY and NZDJPY are close to taking out the previous low while AUDJPY already took it out. 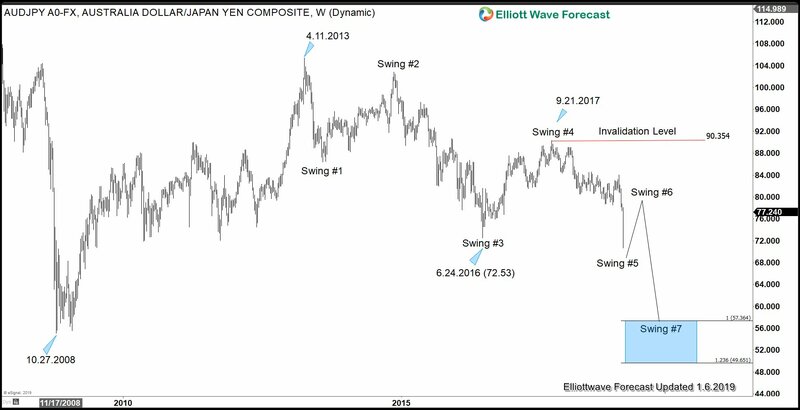 The technical outlook of these three Yen pairs suggest that we will continue to see Yen’s strength in 2019.